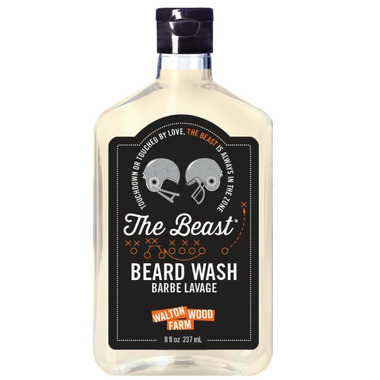 Tame your mane and dominate the game with Walton Wood Farm's aloe and argan oil Beard Wash. This super conditioning beard wash has a cumulative effect. After all, a soft grizzly beast, is a cuddly grizzly beast. Cardamom, cracked pepper and mandarin scent. Ingredients: Water, Sodium C14-16 Olefin Sulfonate, Cocamidopropyl Betaine, Cocamide MEA, Disodium Laureth Sulfosccinate, Glycerin, Aloe Barbadensis Leaf Juice, Acer Saccharum (Sugar Maple) Extract, Citrus Aurantium Dulcis (Orange) Fruit Extract, Citrus Limon (lemon) Extract, Saccharum Officinarum (Sugarcane) Extract, Vaccinium Myrtillus Fruit Extract, Cananga Odorata Flower Oil, Citrus Aurantium Dulcis (Orange) Peel Oil, Fragrance.